This morning, I posed a question to my Twitter followers… Outside of the bathroom, what is the biggest annoyance #IBD brings to your life on a daily basis? The reason I asked Outside of the bathroom is because when most people hear IBD they automatically associate it with the bathroom and being on the toilet. Those that live with IBD know that the bathroom is only a small part of what we really go through. I received a good response to it and surprisingly most of the responses were NOT what I expected them to be. I expected the majority of responses to be The endless amounts of IV’s or The constant blood work I have to get done and maybe even My mail is being delivered to my GI doctors office as my primary residence now. I did get some responses like those but the overwhelming amount of responses I got were how hardly anyone else understood what they were going through. You could feel the frustration in their tweets and how they just wish that more people around them understood. This got me thinking about the question I asked on Episode 7 of The IBD Round Table Discussion, who’s job is it educate and bring awareness to the general public? Is it the job of big national organizations like The Crohn’s and Colitis Foundation of America ( CCFA )? Maybe medical associations like the American Gastroenterological Association ( AGA ) should be doing PSA’s on it? Or should it be the grassroots foundations and communities like The Great Bowel Movement, The Crohn’s Journey Foundation, and others? The CCFA tried eight months ago with their Escape The Stall campaign, which I felt did more harm than good. Don’t get me wrong, the CCFA does some great work! Camp Oasis and the research they do is absolutely amazing… But I’m tired of seeing IBD explained as a bathroom issue! The thought of the AGA putting together a campaign doesn’t instill a whole lot of confidence either. I’ve yet to find an IBD related video from medical professionals on YouTube, or anywhere else for that matter, that didn’t put me to sleep in the first 30 seconds and I’m passionate about IBD. So that leaves us with the grassroots foundations and communities, the very heart and soul of IBD. 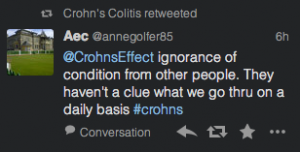 I truly believe that there isn’t anyone better to speak on behalf of what IBD patients go through than the grassroots! But the grassroots have one problem… We don’t have the funding and resources that bigger organizations, like the CCFA and AGA have. Sure, we can work hard, raise the funds, and run a national spot… maybe once or twice. But we’re going to have to do better than that if we want to make IBD a household name so people really understand what we go through. The answer to the problem is pretty simple as I see it… We need a partnership between the CCFA and the grassroots! The CCFA has the resources and the grassroots have the ability, knowledge, and understanding to connect with the hearts and minds of the world. IBD has been around for a long time now… Five million people worldwide are afflicted with the disease… Isn’t it about time that the world truly understands what this invisible illness is all about? Thank you Brian! I appreciate the kind words and support! Knowledge Is Power – It isn’t until we make IBD a household name and the general public TRULY understands what having IBD is, will we see life improve for the millions of people that have it! We are stronger together than we are apart! Let’s work together to bring education and awareness of IBD to everyone! By partnership you mean direct funding from CCFA and AGA? What if the CCFA used it’s resources to get national TV spots / magazine ads / billboards ads / etc but allowed the Grassroots Leaders to come up with the campaign of what those ads would say / portray? What if the CCFA, through it’s local chapters sponsored events that the Grassroots Leaders ran in the local communities to bring awareness of IBD to the general public? Awesome! Sounds like it’d be really easy for CCFA to facilitate the first part even with something as simple as a “make our next ad” contest.